I cannot believe this is only three weeks off! If you are near enough to come along and haven’t yet booked tickets with us then do do do! I cracked all the usual ‘poo’ jokes in my notice from the front of church on Sunday then afterwards a friend told me I’d undone all her hard work training her daughter off toilet humour…oops! It’s going to be a great night. Poo’s green curry is the best we have ever tasted but more than that she is a beautiful woman with a beautiful story that needs to be heard. We can’t wait to host our Thai friends and hope that the UK weather will be kind to them. Though I seem to remember it snowing in March the last few years? In Shrewsbury the team will be at The Birds Nest Cafe in the Market Hall from 10 – 2 on Thurs 27th March doing some cooking demonstrations with plenty of tasters of course! 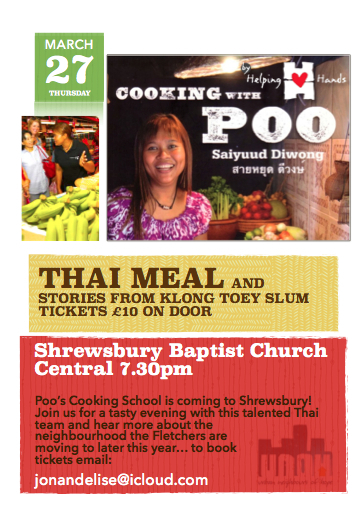 The evening is our Thai meal (see flyer above) and then the next day is being spent in Crowmooor School followed by our Xtra Time kids club. This makes me realise we have lots of planning to do!